I wanted to write a blog on a subject I’m incredibly passionate about, the power of connection. Human beings are wired for it and now we have evidence that it’s crucial for business success. A useful way to view our professional network is through LinkedIn Labs In Maps. I’ve presented mine below, which is categorised by colours. 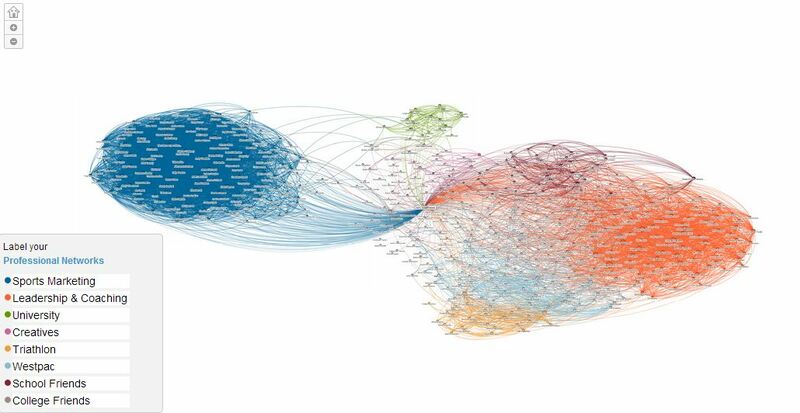 The dense blue connections on the left shows my London sports marketing network and the orange on the right my Sydney leadership and coaching network. Other categories include university friends and triathletes from my club. Of great interest from a network perspective are the brokers between my network areas and those on the periphery who are most likely to disrupt my thinking or introduce me to someone outside of my network. 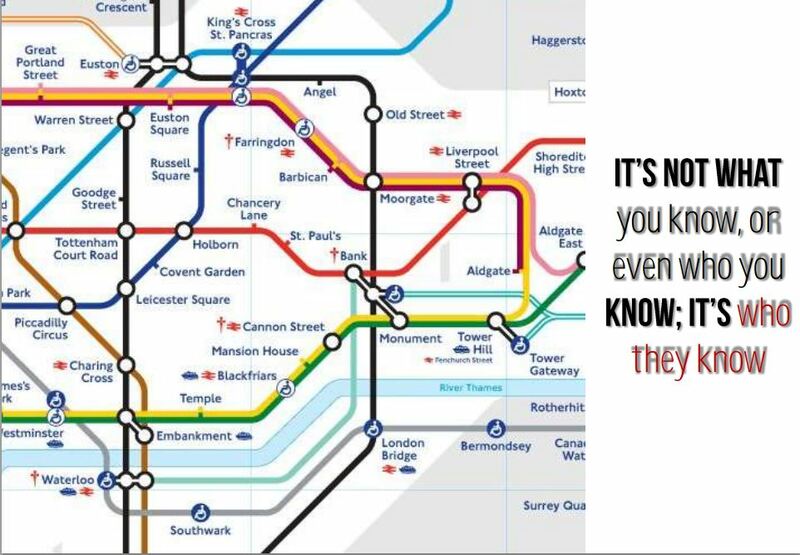 I would encourage you to map your network and have a look! To make real connections with key members of your network I recommend you reach out and arrange a face to face meeting or skype with a mutual purpose to build rapport. Now, let’s look at connection in a leadership sense…. At the recent Change Management Institute (CMI) Conference I attended Dr Hilary Armstrong our Director of Education at the IECL explored the notion of Connected Leadership which I have had the pleasure and fortune of working with her closely on. The key here is that leadership in the modern world is not about the individual hero leader, it is about mobilising the network of relationships (connections) within and without. 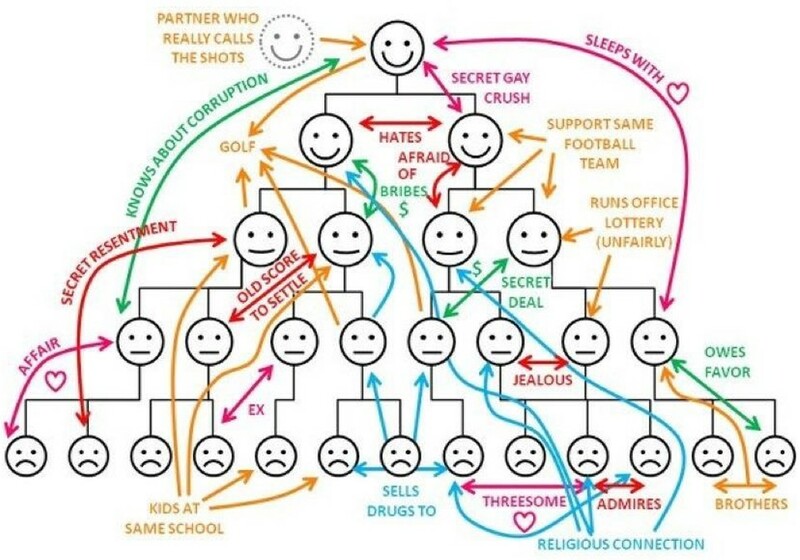 The traditional formal hierarchy org charts that nearly all companies have do not reflect the informal network and the way the work really gets done in organisations (fun graphic below!). I know in my work one of my greatest working efficiencies is with a colleague John who I would not be connected to on a formal org chart, have a think about the 5 key people you work with and whether you are connected on an org chat? The method of measuring connections and collaboration patterns is achieved through evidence based Social Network Analysis (SNA) software. The IECL have partnered with connection and SNA software experts Optimice in the leadership and coaching space to bring this to life for organisations. Cai Kjear, a partner at Optimice is featured in this great HR Monthly Article You Need a Map for those who are interested in reading more (highly recommended!). Below is an example of an SNA map to show collaboration patterns across different business units (different coloured nodes) in a part of a well known organisation. The live map is dynamic and can be filtered many ways including to show intact team connections and for the idea and energy networks in organisations, fascinating stuff! In this example, after Optimice mapped the data the IECL worked closely with the network through insight and action workshops and collaboration forums to find motivators to create membership and mobilise the network during a period of transformation. The results have been highly impressive including a 15% increase in employee engagement this year. 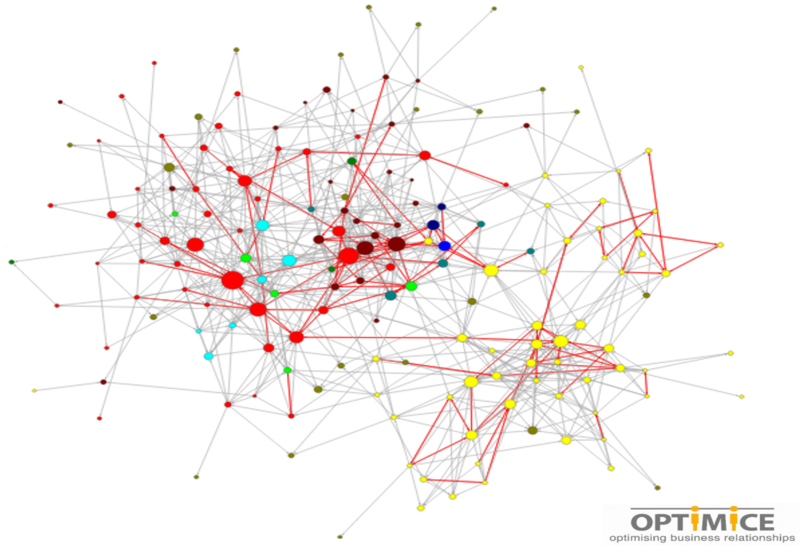 I’m excited to start Optimice’s Organisational Network Analysis online course this week and am eager to explore this area of passion further which I truly believe has the potential to change organisations for the future!